Many young people say they want to carry on Dr. King’s legacy. They want to battle racism, hate, and intolerance to level the societal playing field and unify us. It is for these reasons they want to stop Donald Trump and his supporters, believing they stand for the opposite and try to divide us. 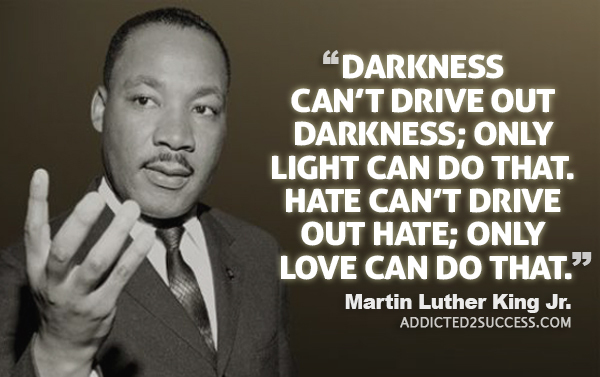 Yet, it seems in Chicago the other night they forgot about the “how” that Dr. King used to fight ALL bigotry and hatred. The protestors who went to the Trump rally were well organized. They came armed with inflammatory t-shirts and signs with the intention of pressing buttons and inciting Trump supporters. They have admitted as much. “They got the job done, Vickie Deanda, 54, an accountant from Chicago, said of the demonstrators. “Someone has to object to this hatred" (Source: New York Times article). They went there not to protest peacefully, which is their right, but to shut it down and prevent it from taking place, infringing on Trump’s right. When I got on Twitter the evening after the rally was cancelled, many young people, who claimed to have been at the venue and part of the anti-Trump crew were gloating about how they had won; by ‘shutting down’ hate. They were openly proud of the fact that they had forced Donald Trump to send home his supporters, and cancel a legally organized and permitted event. The irony is that these so-called champions and defenders of free speech did not seem to care that they had just trampled on someone else's right to it. I am not writing to defend Trump, but in Chicago the actions of the demonstrators made him seem the victim and brought people who despise him, like me, to his defense. This while also emboldening his supporters by proving both that they do not have a voice in this country and that they get shutdown when they try to express it. So I ask you, what was achieved? Trump has shown that he lacks both the maturity and the temperament to lead. He openly tells lies, bullies people when confronted, and uses reckless, irresponsible rhetoric to prey on genuine fears. That is not leadership; it is cowardice. Anyone can use people’s insecurities, fear and anger to rally them. True leadership aims to help people rise above. That is the point I want to make to the next generation of America. To beat Trump we need to unite and rise above the anger, fear and frustrations he uses to rally his base. This means we need to first acknowledge the very real fears of many Americans; people who have lost their jobs to foreign countries and immigrants like me. We need to acknowledge their realities and struggles to make ends meet without the proper education, skills or training necessary to compete in a technologically-driven and rapidly changing world. And we need to offer them an alternative narrative to his hate, bigotry and divisiveness. That is how we beat Trump and win, not by resorting to his bullying, bashing and shouting. Some of the young people on Twitter told me that we are at war; they compared Trump to the rise of Hitler. To them I say first we are not at war, but yes, we need to fight back. However, it is imperative we do so by upholding our values, beliefs and principles, not by compromising them by fighting on Trump's terms. Even during WWII we did not gas every Nazi soldier we captured, though many of us could have justified it, nor did we execute those responsible for setting up and running the concentration camps; we tried and sentenced them. Our actions when fighting and punishing them were not based on an emotional reaction to the heinousness of their crimes, but on our values, humanity, intellect and sense of justice. One young man on Twitter asked me how we beat Trump. To him and every other young person angered by his hate-filled rhetoric, I say we do it by uniting; that is the only way. This is a time to look beyond party lines; there are no republicans or democrats in this fight. We are all Americans and irrespective of our political differences, we share the same values. Only by standing together, united as one nation, can we show Trump that he will not hijack a nation by misleading and playing on the fears and emotions of a small group of angry people. We need to show him that we are better than that. That we can put aside our differences when something greater is at stake and defeat a common enemy. Trump is appealing to humanity’s basest instincts; we must appeal to the noblest. Remember, that while we should be willing to die for our cause, we should never be willing to kill for it. This is what differentiates us from the people who are filled with hate. If we are to lose that distinction, we become no different than people we disagree with, even if our cause claims to be the greater one. If we continue to act upon our emotions (especially with our right to bear arms) we will end up with nothing...no hope...no respect...no country! Unfortunately if the stand against Trump doesn't march down the righteous path, Trump will get more votes and more of the "I told you so's" Let be strong AND more compassionate...it's easier to be loud and ignorant like a Trump...don't be a Trump--take the time to understand!